Many of the young people at Kites have suffered considerable trauma in their lives including attachment breakdown, rejection, abandonment and abuse. A vital component to treatment aims to address the dysfunctional defense mechanisms and destructive unconscious phenomena caused by abuse, which can play a significant role in abusive behaviour (Rich, 2006). If attachment difficulties or destructive defense mechanisms are identified as treatment issues, these will be addressed through the young person being supported to make unconscious material conscious, so to support the ego (Trauma Recovery Model, Skuse & Matthew, 2015). Through facilitating the young person to identify his destructive defense mechanisms, he is enabled to regain control over their use by replacing them with a more functional response. Many of the young people we treat have been victims of sexual abuse so we provide intervention to address their victim status, whilst maintaining an expectation that they take responsibility for their own abusive actions through the development of key characteristics such as honesty, trust, loyalty, and concern. Attachment deficits are addressed through the experience of reflective, containing and nurturing therapeutic care provided within the residential home, which allow the young person to redress past experiences of abuse, neglect or rejection, and provides invaluable role-modeling of safe, negotiated and empathic relationships, which includes the non-violent resolution of conflict and appropriate self-regulation. The Trauma Wheel identifies areas of treatment focus that are identified as effective to the recovery from traumatic experiences. Practical uses of the Trauma Wheel are driven by the young person’s developmental level, as understood through the initial assessment. By understanding the young person’s intellectual, cognitive, and social levels of functioning, developmentally appropriate treatment plans can be formulated, improving the likelihood that interventions will be effective. Creating new containing and attuned relationships can help resolve trauma by reducing feelings of disconnectedness. Therapeutic relationships with carers and other therapy team members help the young person re-create a sense of trust, safety, security and control, in addition to re-establishing healthy boundaries and developing solid attachments. A young person’s ability to attach and appropriately interact with others influences how they engage in therapy and in other areas of their life. Culture refers to, “…beliefs, attitudes, values and standards of behaviour that are passed from one generation to the next” (Abney, 2002). Cultural groups can include, but are not limited to, people identifying with various racial and ethnic groups, age groups, religious affiliations, and genders. Cultural groups can also include gay, lesbian, bisexual, and transgender groups (Hoban & Ward, 2003). Understanding the young person from a cultural perspective and exploring how their culture, the family’s culture, and their level of acculturation impacts their perception of the world is important to the therapeutic process. Additionally creating a facilitative and reflective culture around the young person is vital to therapeutic efficacy. Trauma integration is the process through which traumatic memories, thoughts, feelings, and behaviours related to the trauma are understood, accepted, and integrated within the young person’s view of themselves and the world around them. Affect regulation, also called emotional regulation, can be defined as the ability to tolerate and cope effectively with distress. Specific skills to increase affect regulation include distracting oneself, thinking about the pros and cons of a behaviour, and learning to self-soothe through relaxation techniques. Therapy utilising a trauma-specific approach helps young people to identify the maladaptive cognitions (thinking errors) related to the traumatic experiences, including false beliefs about the traumatic experiences, and beliefs about the self and the world that have been altered because of trauma. Skill building allows young people to learn new, more adaptive skills and provides a safe place to practice those skills. Psychoeducation is the provision of education within the therapeutic environment. By taking the time within therapy to share information, young people and their families gain knowledge of issues related to trauma. This process can validate and normalize the young person’s experience of trauma. Through psychoeducation, parents and young people learn what to expect during the course of treatment and why different types of trauma or abuse occur. Systemic dynamics refers to the many different “systems” in which the young person lives. These can be the family (immediate and extended), the school, community and any other system in which the young person belongs. Research on resiliency, or the ability to adapt in the face of challenges and adversity, emphasises the importance of young people having environmental supports and opportunities. These supports can come from family, school, or the community. 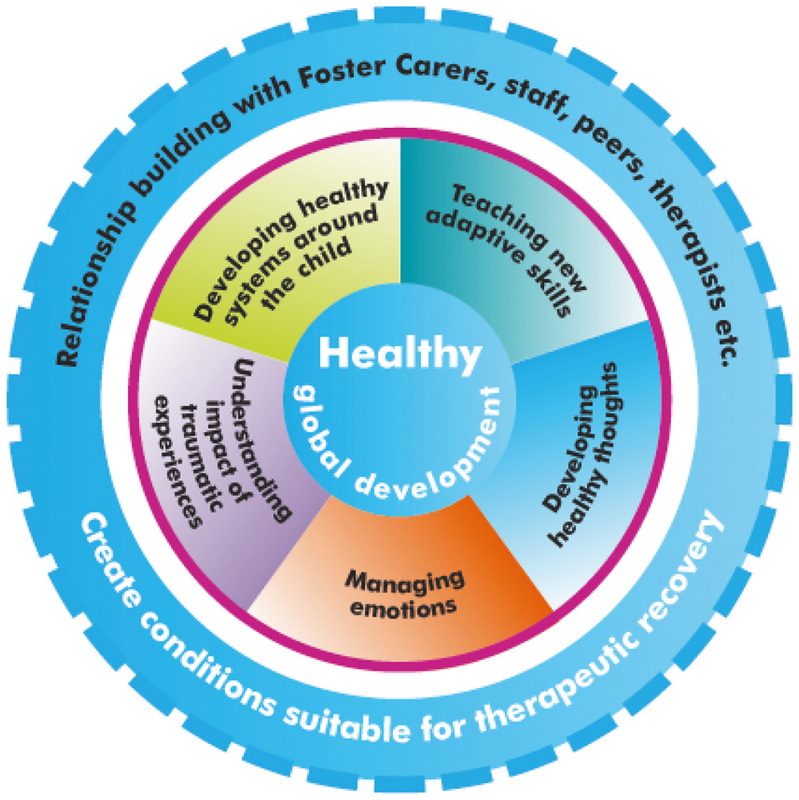 Areas identified as relevant to the young person within the trauma wheel are addressed within individual therapeutic treatment, group work and within the directed focus of the Kites Integrative Treatment Plan.